Another update on former Wizards. Nothing big player news wise, but an interesting quote from Aberdeen's coach in response to rumors of Eddie Johnson moving to the club. Basically he said that he'd heard of the player but he hadn't scored a goal in years. Makes you want to say ouch for the former Wizard. Here's the rest of this week's update. Stephane Auvray - New York - Game last week was canceled due to hurricane Irene. Adam Cristman - LA - Started and played 71 minutes in LA's 2-0 win over LD Alajuelense in the CCL. Luis Gil - Salt Lake - Started and played 86 minutes in RSL's 1-0 win over Chivas. Taylor Graham - Seattle - Did not dress in Seattle's 6-2 win over Columbus. Did not dress in Seattle's 1-0 win over Dallas in the US Open Cup. Kevin Hartman - Dallas - Started and played 90 minutes, recording the shutout in Dallas' 1-0 win over Toronto in the CCL. Started and played 90 minutes in Dallas' 3-2 win over KC. Started and played 90 minutes for Dallas in their 1-0 loss to Seattle in the US Open Cup. Frankie Hejduk - LA - Dressed but did not play in LA's 2-0 win over LD Alajuelense. Will Hesmer - Columbus - Started and played 90 minutes in Columbus' 6-2 loss to Seattle. 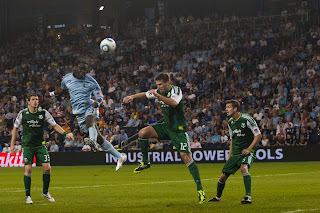 Jack Jewsbury - Portland - Game last week was canceled due to hurricane Irene. Mike Jones - New York - Game last week was canceled due to hurricane Irene. Jonathan Leathers - Vancouver - Started and played 90 minutes in Vancouver's 1-0 win over Houston. Rauwshan McKenzie - Salt Lake - Did not dress in RSL's 1-0 win over Chivas. Kurt Morsink - DC - Game last week was canceled due to hurricane Irene. Scott Sealy - San Jose - Did not dress in San Jose's 1-1 draw with Toronto. Khari Stephenson - San Jose - Came off the bench and played 24 minutes in San Jose's 1-1 draw with Toronto. Tyson Wahl - Seattle - Started and played 90 minutes in Seattle's 6-2 win over Columbus. Dressed but did not play in Seattle's 1-0 win over Dallas in the US Open Cup. Josh Wolff - DC - Game last week was canceled due to hurricane Irene. Kevin Friedland - Minnesota - Did not play in Minnesota's 2-0 loss to Montreal. Aaron Hohlbein - Fort Lauderdale - Did not dress in Fort Lauderdale's 3-0 loss to Tampa. Amir Lowery - Montreal - Started and played 90 minutes in Montreal's 2-0 win over Minnesota. Scott Lorenz - Minnesota - Started and played 90 minutes in Minnesota's 2-0 loss to Montreal. Ryan Pore - Montreal - Started and played 87 minutes in Montreal's 2-0 win over Minnesota. Abe Thompson - Fort Lauderdale - Came off the bench and played 23 minutes in Fort Lauderdale's 3-0 loss to Tampa. Stephen Armstrong - Charleston - Season is over. Edson Elcock - Richmond - Started and played 90 minutes in Richmond's 3-0 loss to Orlando. Started and played 90 minutes in Richmond's 2-1 loss to Chicago in the US Open Cup. Tom Gray - Pittsburgh - Season is over. Neal Kitson - Rochester - Started and played 90 minutes in Rochester's 2-1 loss to Harrisburg. Akeem Priestley - LA - Season is over. Yomby William - Richmond - Started and played 90 minutes in Richmond's 3-0 loss to Orlando. Started and played 90 minutes, scoring a goal in Richmond's 2-1 loss to Chicago in the US Open Cup. Vicente Arze - Diosgyor - Hungary - Came off the bench and played 17 minutes in Diosgyor's 2-1 win over Siofok. Lost 2-1 to Debrecen in the cup. Pablo Escobar - Deportivo Cali - Colombia - Did not play in Cali's 1-0 win over Cucuta Deportivo. Did not play in 1-1 draw with Once Caldas. Herculez Gomez - Tecos - Mexico - Came off the bench and played 16 minutes in Tecos' 2-1 loss to Atlante. Zoltan Hercegfalvi - Honved - Hungary - Did not play in either of Honved's games. Will John - Vinogradar - Croatia - Did not play in Vinogradar's 2-0 loss to Gorica. Igor Kostrov - FC Tiraspol - Moldova - Started and played 90 minutes in Tiraspol's 2-0 win over Nistru. Carlos Marinelli - Universidad San Martin - Peru - Started and played 90 minutes in San Martin's 1-0 win over CNI. Yura Movsisyan - FC Krasnodar - Russia - Started and played 90 minutes in Krasnodar's 5-0 loss to Zenit. Matt Taylor - SC Paderborn 07 - Germany - Dressed but did not play in Paderborn's 0-0 draw with Eintracht Frankfurt. For the 4th time this season KC dropped points late in a game. KC dropped 2 in Vancouver giving up 2 late goals, a point in Seattle once again, and 3 points at home against both Seattle and Dallas. Those 9 points (and 4 and 3 removed from Seattle and Dallas respectively) would see KC sitting on 45 points, putting them 5 points clear of Columbus for first in the East and second in the entire league behind LA. In those games KC allowed goals in the 92+, 93+, 93+, 90, 92+, 89, and 92+ minute. It's a disturbing trend for KC that has developed over the course of the season, that's over 20 percent of KC's 34 goals allowed this season. To be fair, KC has scored 3 goals in that same general period of time to earn themselves a point when they were losing, scoring in the 93rd vs Chivas, 90th vs Houston, and 89th vs New England. Still without those points, that's still 6 points that KC have lost giving up late goals. So what's the reason for the late goals? Is it the red cards? No, because of the four games that KC have lost points late in, only half of them involved someone on Sporting KC getting a red card. Factor in KC's games they've gotten points late in and it's 4 of 7. I think it comes down more to the coaching under Peter Vermes. The "fire Vermes" crowd has gone quiet lately, and I'm not on that band wagon right now, but I think that Vermes needs to change his strategy late in the game. The team seems to be able to cope better when they are trailing late in the game, see the Chivas, Houston, and New England game. Less so when they are leading. It's not just been the Vancouver, Seattle, and Dallas games either, recently the trend has been seen in the Real Salt Lake and DC games as well. Where KC had a late lead while the opponents attacked relentlessly. It's really starting to become worrisome, while KC's home record has been solid, the inability to be able to lock down games is going to hurt KC big time late in the season if it hasn't already. The team knows it's an issue, it's a matter of fixing it. My problem though is that it doesn't seem much has been done to fix it. I also see Zusi's quote in the article and think "shouldn't it have been a wake up call the first or even the second time?" This was the 3rd time KC's blown a late lead, and 4th time they've dropped points late. If the team hasn't already woken up (especially now), then this team isn't going anywhere this season. Today US Soccer announced the roster for the women's team when they visit KC to take on Canada on September 17th at LIVESTRONG Sporting Park. The roster contains all 21 players from the USA's run to the World Cup final this year in Germany. It'll be a nice doubleheader for those wanting to go out on that Saturday as following the US game they'll be showing the Sporting KC vs Real Salt Lake game. The Missouri Comets second season kicks off on Thursday November 3rd when they travel to Wichita to take on the expansion Wings in the opener of the new season. The two teams will meet again the next night, November 4th, at the Independence Event Center in the Comets home opener. The MISL this year has expanded under their partnership with the USL, only 3 teams return from last year (the Omaha Vipers and Chicago Riot are gone), but 5 new expansion teams come in. The 8 teams are being divided into 2 divisions, an East and a Central. Joining Missouri in the Central is the returning Milwaukee Wave, the Wings, and a new expansion side in Chicago unaffiliated with the Riot. In the East the Baltimore Blast are joined by 3 expansion teams, the Norfolk SharX, Rochester Lancers, and Syracuse Silver Knights. The format for the 2011-2012 season will see the league schedule expand from 20 to 24 games. Teams will play 16 games against teams in their own division, 6 against their closest opponent (Missouri-Wichita, Milwaukee-Chicago, Rochester-Syracuse, and Norfolk-Baltimore), the longest of which is a 4 hour trip for Baltimore and Norfolk, a good move for the league to help reduce some travel cost. They'll play 5 games each against the other two teams in their division. They'll play a home and away game against the four teams in the other division, giving them their 24 games. The top two teams in each division will qualify for the playoffs, a home-away series with a mini-game after the second if it is needed. The finals will be played with the same format. Here are your Sunday after stats for this week. Kei Kamara scored his 20th goal in all competitions for KC, he's the 11th player to hit that mark for KC. With that 20th goal, Kamara ties Igor Simutenkov and Chris Brown for 9th place on the list of goals in all competitions. Teal Bunbury's red card was the 8th league red card of the year for KC, setting a team record. The game last night was KC's 50th game in all competitions between KC and Dallas, KC holds a slim 22-20-8 record, but is behind in goals 76 goals for, 82 against. A record MLS crowd came out tonight at LIVESTRONG Sporting Park to see Sporting KC blow a late lead again to lose 3-2 to FC Dallas (more on that tomorrow). But the record 20,018 attendance got an exciting game, unfortunately it ended well for the wrong side. It's the second time this year that KC has gone over their 18,467 announced capacity with standing room only tickets. For a look at the 11th game attendance comparison, check here. Here's for the 12th home game. Here's a look at the rankings, the break the record night held in 2003 to try to top the largest attendance for a game at Arrowhead joins the list and boosts the 2003 season average over 1,000. The 2011 season gets a standing room only bounce. Here's how the seasons look. Not much movement this week. The gap closed on the 2011 season, but from here on out the 2003 season falls quite a bit. The 2011 season should easily finish on top even without any more Saturday night games. Sporting Kansas City has a chance to create some space between themselves and having to play a play in game for the playoffs. With teams 4 through 6 (Philadelphia, New York, and DC) all being off this weekend now due to Hurricane Irene (hope all my East Coast friends are OK) it's a chance for KC to get themselves further away from the chasing pack trying to get into one of the three automatic playoff spots. KC could move 5 points clear of Philadelphia and 8 points clear of 6th place DC. A big opportunity to put pressure on those three teams to win the games in hand that they'd have following this game. While it's nice to have games in hand, in the long run it's better to have the points already in hand. Tomorrow KC play Dallas in what at one time was called the Urology Cup (Burn-Wiz, get it?). Dallas come into Kansas City on short rest, the 3rd straight team to do it. Dallas had to play a game and a half over the course of Wednesday and Thursday as their CONCACAF Champion's League game against Toronto was canceled after a half on Wednesday and had to be made up in full on Thursday. With another game on Tuesday in the US Open Cup, Dallas could possibly look to focus on their non-league schedule during this stretch, giving KC better chance for a win for KC. It'll be Kevin Hartman's first game back in KC after being traded before last season since he missed last year's game due to injury. This could be a big trap game for KC. Last time these two teams played, the roles were reversed with Dallas on the hot streak and KC coming into town on the hot streak. That result didn't turn out too well for Dallas as KC rolled to a 4-1 win without Omar Bravo and with Kei Kamara making a late substitute appearance. Hopefully with the roles reversed KC can get the job done this time around. There are still questions about a few of KC's players, Aurelien Collin could be back in the team for the game for the first time since his back injury, but the team's second designated player, Jeferson is still listed as questionable and may not play again this week. Number to Remember - 3 - Three straight teams have come into KC with less than 3 days rest. KC defeated both Portland and DC on short rest, they'll try to complete the effort by taking out Dallas tomorrow. Key Match Up - KC offense vs Kevin Hartman - Hartman gets to return to KC for the first time since leaving the Wizards and while he got the first game chip off his shoulder last year, he's likely to want to impress in his first game back in KC. The KC offense has been doing well lately, much better offensively than they have previously. PREDICTION - KC should win this game, the lack of rest for Dallas is going to be rough on them, especially with another game on Tuesday. Even if Dallas puts out their best 11 again KC should be able to pressure them early and eventually they'll wear out. But as I said earlier, this is a trap game, it's a game that KC's expected to win against a good opponent who just happens to be in a congested part of their schedule. Still KC should be able to win this one. Lots of international team news was announced today, and 4 Sporting KC players were affected. First, Kei Kamara's call up for the Sierra Leone national team was confirmed by the team today, although I think Kamara tweeting last night that he'd been called up was proof enough that he'd been called up for their African Cup of Nations qualifier against Egypt at home. In other news, and probably the most surprising of KC's call ups, was the news that Teal Bunbury has been called up for the US national team. Bunbury returns to the national team for the first time since Camp Cupcake this past January. A little surprising in the call up as Bunbury's form hasn't been extremely good. But it has improved since earlier this year. The US play Costa Rica in LA on Friday the 2nd before heading to Belgium to take on the Belgians on the 6th. Combine his absence with Kamara's and KC's front line is going to take a hit for the LA game next weekend. Shavar Thomas has also received another call up for Jamaica. The Reggae Boyz have a friendly in Quito, Ecuador on September 2nd. It'll be another opportunity for Thomas to captain his country. Thomas could possibly be back in town for the game against LA, but may not be needed depending on the health of Aurelien Collin and his ability to play. Finally, word from the team today is that while the forward line will suffer against LA, the midfield is just a little better. Roger Espinoza will not be leaving to join the Honduran team for their friendlies against Colombia and Paraguay and will instead be available for selection against the Galaxy. That's a big boost to the midfield, especially since Collin is unlikely to be 90 minutes fit yet, and that leaves KC a little short in the d-mid position. According to Kei Kamara on Twitter tonight, he has been called up for the Sierra Leone national team for their upcoming African Cup of Nations qualifier against Egypt. With the call up, Kamara looks set to miss the game against the LA Galaxy two days after Sierra Leone's game on the 3rd. A blow for KC in a game that was moved by Farm Aid. Sierra Leone really needs a win in this game in Freetown, Sierra Leone. A loss puts them in real danger of not making the tournament. Word out of Egypt has been that the Egyptian team will be using a U-23 side for their final two games, which could be a boost for the Leone Stars. Kamara joins Roger Espinoza as players that have received call ups for the international break coming up next week. Word is that Peter Vermes though is trying to work out a deal so that Espinoza will stay with the team. Here is this week's former Wizards update. It's one player short this week, as the Portland-Chivas game with Jack Jewsbury is on going at the time of this post. Stephane Auvray - New York - Came off the bench and played 18 minutes in New York's 2-2 draw with New England. Adam Cristman - LA - Started and played 79 minutes in LA's 2-0 win over San Jose. Luis Gil - Salt Lake - Started and played 90 minutes, scoring a goal in RSL's 3-2 loss to Houston. Taylor Graham - Seattle - Did not dress in Seattle's 1-0 win over Dallas. Dressed but did not play in Seattle's 1-0 win over Monterrey. Kevin Hartman - Dallas - Started and played 90 minutes in Dallas' 1-0 loss to Seattle. Frankie Hejduk - LA - Started and played 90 minutes in LA's 2-0 win over San Jose. Jack Jewsbury - Portland - Started and played 90 minutes, recording an assist in Portland's 2-1 win over Vancouver. Playing Chivas tonight. Mike Jones - New York - Did not dress in New York's 2-2 draw with New England. Chris Konopka - MLS Pool keeper - Did not play this weekend. Jonathan Leathers - Vancouver - Dressed but did not play in Vancouver's 2-1 loss to Portland. Rauwshan McKenzie - Salt Lake - Dressed but did not play in RSL's 3-2 loss to Houston. Kurt Morsink - DC - Did not dress in DC's 1-1 draw with Chicago. Did not dress in DC's 1-0 loss to KC. Scott Sealy - San Jose - Did not dress in San Jose's 2-0 loss to LA. Khari Stephenson - San Jose - Started and played 71 minutes in San Jose's 2-0 loss to LA. Tyson Wahl - Seattle - Dressed but did not play in Seattle's 1-0 win over Dallas. Started and played 90 minutes in Seattle's 1-0 win over Monterrey. Josh Wolff - DC - Came off the bench and played 30 minutes, scoring a goal in DC's 1-1 draw with Chicago. Started and played 65 minutes in DC's 1-0 loss to KC. Aaron Hohlbein - Fort Lauderdale - Did not dress in Fort Lauderdale's 2-0 loss to Carolina. Ryan Pore - Montreal - Started and played 70 minutes, scoring a goal in Montreal's 2-0 win over Minnesota. Abe Thompson - Fort Lauderdale - Started and played 90 minutes in Fort Lauderdale's 2-0 loss to Carolina. Stephen Armstrong - Charleston - Came off the bench and played 63 minutes, recording an assist in Charleston's 3-1 loss to Orlando. Edson Elcock - Richmond - Started and played 104 minutes in Richmond's 0-0 (5-4) shootout win over Wilmington. Tom Gray - Pittsburgh - Started and played 90 minutes in Pittsburgh's 4-0 loss to Rochester. Neal Kitson - Rochester - Started and played 90 minutes, recording the shutout in Rochester's 4-0 win over Pittsburgh. Akeem Priestley - LA - Did not dress in LA's 3-2 loss to Harrisburg. Yomby William - Richmond - Started and played 120 minutes in Richmond's 0-0 (5-4) shootout win over Wilmington. John Wilson - Charleston - Did not dress in Charleston's 3-1 loss to Orlando. Sergei Raad - FC Jax Destroyers - Season is over. Vicente Arze - Diosgyor - Hungary - Came off the bench and played 26 minutes in Diosgyor's 1-1 draw with Ujpest. Sunil Chhetri - Chirag United - India - Did not have a game this week. Pablo Escobar - Deportivo Cali - Colombia - Did not have a game this week. Herculez Gomez - Tecos - Mexico - Came off the bench and played 20 minutes, scoring a goal in Tecos' 2-1 win over Pachuca. Will John - Vinogradar - Croatia - Lost 3-1 to Mosor. Igor Kostrov - Tiraspol - Moldova - Started and played 90 minutes in Tiraspol's 2-0 win over Academia UTM. Carlos Marinelli - Universidad San Martin - Peru - Came off the bench and played 24 minutes in San Martin's 1-0 loss to Juan Aurich. Yura Movsisyan - FC Krasnodar - Russia - Started and played 90 minutes in Krasnodar's 1-0 loss to Lokomotiv Moscow. Matt Taylor - SC Paderborn 07 - Germany - Dressed but did not play in Paderborn's 2-1 win over Dynamo Dresden. Diego Walsh - TOT SC - Thailand - Lost 3-1 to Muang Thong United. Sporting KC midfielder, Roger Espinoza looks set to miss the upcoming game against the LA Galaxy over Labor Day weekend. This is because Espinoza has been called up by the Honduran national team for a pair of friendlies against Colombia and Paraguay. Honduras starts this international break with a game in New York at Red Bull Arena against Colombia on the 3rd of September before heading down to Honduras for a friendly against Paraguay on the 6th. That second match is the day after Kansas City is set to take on the LA Galaxy at LIVESTRONG Sporting Park in a game that was moved to the weekend due to Farm Aid coming to the stadium. Sierra Leone hasn't announced their roster yet for their qualifier against Egypt, but I'd expect Kei Kamara to be gone for that game as well. The good news for KC is that Robbie Keane has already been called up for Ireland for their Euro qualifiers, and it seems a good bet to think that Landon Donovan will receive a call up as well. We will find out for sure in the next couple days. Today the Missouri Comets and Kansas City Command announced a partnership deal that on face value looks like a good move for both sides. Both teams have their share of followers and sponsors, but a coordinated effort between both of them actually will benefit them in the long run when it comes to sponsorship dollars. The release though seems to focus more on what their partnership will do for the Command instead of the Comets. It talked about the combined staff selling season tickets for the Command. That's not totally surprising considering the Command play at the Sprint Center, which seats over 3 times the number of seats that are in the Comets home, the Independence Event Center. It seems like it's a big deal to support the Command. But the Comets are also getting their name out there more with this, and the combined efforts will certainly help them hopefully get more in sponsorship dollars as they'll be able to sell full year sponsorship by combining it with sponsorship with the Command. I think this is a very good move for both sides to improve their presence in the city. Very Kei Kamara centric for this week's after stats entries, each one retains to the man from Sierra Leone. Kei Kamara scored the 800th competitive goal in all competitions for KC. Kamara also made his 100th MLS league start of his career. Kamara's goal was his 18th league goal which gave him sole possession of 9th place on KC's scoring list, breaking his tie with Eddie Johnson and Jimmy Conrad. It was Kamara's 19th in all competitions, breaking his tie with Matt McKeon for 11th place on that list. Only a few months ago, Sporting KC was sitting around the bottom of the Eastern Conference, and the questions about the team were very loud. Now, after last night's 1-0 win over DC United, Kansas City now sits in second place in the East, 4 points behind first place Columbus, with the Crew still having to travel to KC. While the score line was only 1-0, KC controlled the game against United, keeping them from leapfrogging KC to get into the top 3 in the East. As KC has been doing lately, they came out hard from the start, pressing the game and trying to create an early goal. They were denied by the post in the 16th minute as Chance Myers played a great cross into the box. 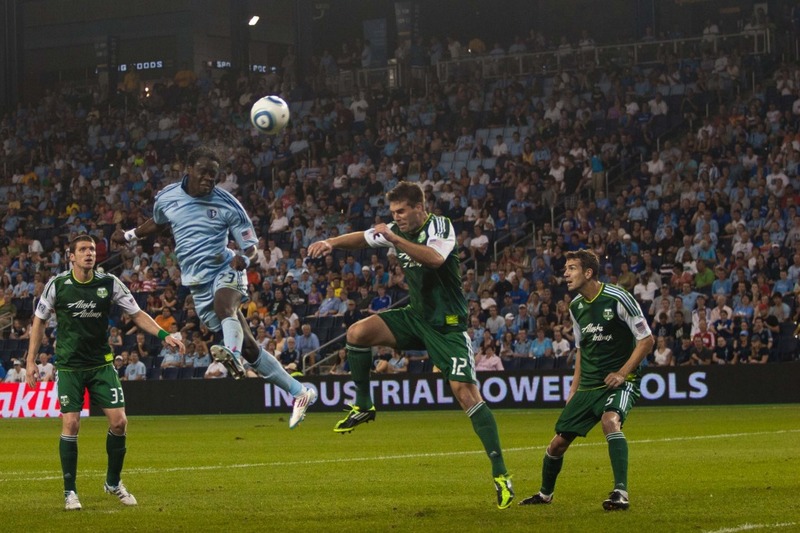 Kei Kamara met it with a snap header, beating Joe Willis, but not the post. Shortly after that chance though KC got the goal they'd been looking for. Omar Bravo collected a long ball from Matt Besler and played a ball into the box for CJ Sapong. The United defense beat him to the ball, but could only clear the ball as far as Kamara. Kamara collected the ball cut the ball inside and then fired a shot that rifled past Willis and into the net giving KC the lead. DC had a good chance to pull level later in the half through Blake Brettschneider. Brettschneider fired a shot from the right of Jimmy Nielsen's net. Nielsen did well to get down and knock the ball away keeping the lead for KC. Late in the first half came a small point of contention in the game. After a play on the sideline, DC rookie, Perry Kitchen shoved Sapong. Kitchen then immediately went to ground like it'd been the one that was shoved. Kitchen was rightly booed for his move, especially after replays of the incident were shown on the video board. Referee Alex Prus gave Kitchen a yellow card for his theatrics. In the second half, DC brought in Dwayne DeRosario to try to ignite their offense that had been struggling as late. The early returns were good as DeRosario fired a shot from outside the box over the bar as DC tried to get back into the game. After the early flurries though, KC started to take more control. Graham Zusi had the best chance in the 60th minute, collecting a centering pass from Kamara and firing a shot that Willis got just enough of to knock over the bar. Later in the game, as KC looked to hold onto their lead and counter DC got more of the chances and possession, creating some half chances, but while nervous, they weren't overly threatening. KC held off the DC attacks and took home all 3 points getting into 2nd in the East. WIZARDS Man of the Match - Chance Myers - Myers has gone from being called a number 1 pick bust on the level of Tahj Jakins and Steve Shak to being one of the first names I wanted penciled on the lineup sheet and starting to get serious calls that he deserves a call up. His defense has been extremely good, and his crosses are some of the best on the team. The game against DC was another example of that. Not horrible attendance wise for KC last night compared to KC's history, but I am a little disappointed that the attendance last night was only 15,352. Hopefully this coming Saturday with a home game we'll see a sell out. Check out the break down for the 11th home game of the season all time for KC. For week 10 and the ability to find others, click here. The 2011 season continues to lead the way, the 2003 and 2004 seasons switch places again. The 2008 season gets a bump from the Beckham game being played at Arrowhead that year instead of at CAB. Here's the list. Tomorrow's game against DC United is an incredibly big game for both KC and DC. Both teams are fighting to work their way into one of the 3 automatic playoff spots for the Eastern Conference as we head into the weekend. KC currently (as of this moment) holds the 3rd spot, but is only 2 points ahead of 6th place DC. Big changes can occur in the standings this weekend as results from Saturday could see KC jump into 2nd place in the East with a win tomorrow against United. KC catches a bit of a break for the second straight game, as like Portland, DC played 2 nights before this time in Chicago against the Fire. United looks set to be missing their starting goalkeeper, Bill Hamid as he picked up an injury late in the first half against the Fire. DC has called in their third goalkeeper, Joe Willis, and apparently also called in MLS pool keeper, and former Wizard, Chris Konopka as well. Combine that with Steve Cronin not showing incredibly well and it seems like it could be a virtual toss up for who starts in goal for DC tomorrow in net. The questions could certainly be something that works to the advantage of Sporting tomorrow. KC themselves are coming in on short rest as well, having played Portland on Wednesday night. The team will have designated player, Omar Bravo is back for selection after sitting out Wednesday's game for his red card against Seattle. Jeferson, the team's other DP looks like he's set to miss his second straight game with injury. That gives KC a few different options in the midfield for tomorrow's game. Peter Vermes could slot Bravo in the midfield leaving his front 3 from Wednesday the same. Or he could go with the same midfield as on Wednesday night, pairing Roger Espinoza, Graham Zusi, and Milos Stojcev together. Finally, Vermes could go more defensive putting on Birahim Diop in place of Stojcev, who wasn't horrible but showed his drastic one leggedness again on Wednesday night. Number to Remember - 2 - That's the number of points between KC and DC. That's the difference between an automatic playoff spot and being out of the playoffs right now. Key Match Up - Roger Espinoza vs Dwayne De Rosario - De Rosario is on his 3rd team of the team of the year, but even so he is putting together an MVP season. Shutting him down tomorrow is going to be the main key. If Espinoza can shut down the Canadian, KC should be able to control this game. PREDICTION - This game is incredibly important for KC. During the course of my writing this post, Houston grabbed a win over RSL and has taken over second place in the East, bumping Philadelphia to 3rd and KC to 4th. Although at this moment Houston has played 2 more games than KC, I'd rather have the points in hand already. KC would still jump into second place with a win. DC's goalkeeper situation I think is going to play a very big role in the game. Hopefully KC will once again take advantage of a team on less rest than they are. Yesterday as a bit of a joke on retiring former Kansas City Wizards defender, Jimmy Conrad, there was a roast done on Twitter using the hash tag, #JimmyConradRoast. Plenty of people got in on the roasting, including current and former players like Kei Kamara and Alecko Eskandarian (see some of the highlights here). One of Eskandarian's comments referred back to the 2004 MLS Cup final between KC and Eskandarian's team at the time, DC United. Plenty was made of Eskandarian's second goal as it certainly seemed that the ball played off Eskandarian's arm, allowing him to control the ball and take it past Conrad. No call was made by Michael Kennedy the referee, but Conrad and KC fans would continue to claim for years that Eskandarian's goal should not have counted. During the roast, Eskandarian finally "came clean" saying that it was indeed a handball on his second goal. It doesn't change the game, or the result, in fact for me it just opens the wound up again. But with a game coming up tomorrow against DC United, watching the highlights certainly gets the blood flowing. Seven years on from that game, only Davy Arnaud remains playing for the same team, although two players, Ben Olsen and Kerry Zavagnin have moved to coaching positions within their respective clubs. The second thrower of the Omar Bravo bobblehead has been named. Today the official announcement came that Cody Wente, had been charged with aggravated battery for the allegedly throwing the bobblehead that hit Jimmy Nielsen underneath his eye. Wente looks set to make his first appearance in front of a judge on Monday, but at this time is still being held on $10,000 bond. The kid looks half petrified in his mug shot and is certainly going to totally regret his decision. With the aggravated battery charge, he's going to have a felony charge on his record for the rest of his life for a stupid decision. The vast majority of us have to face the consequences of our actions and Wente will certainly have to face them. This is hopefully the last time I'll talk about this until a potential result of what happens with the two. Here are some stats from last night's game. Soony Saad made his first MLS appearance for KC, he's the 11th player to make their first MLS appearance with KC this season. He's the 12th in all competitions. Saad's goal was his first for Sporting KC, he becomes the youngest goal scorer in Sporting KC history, topping Yura Movsisyan, who was 19 and 266 days when he scored. Saad is also the third youngest player to appear in a game for Sporting KC behind Nino da Silva and Movsisyan. Jimmy Nielsen made his 50th appearance in both all competitions and league play for Sporting KC, he's the 50th player to hit that mark in all competitions, he's the 41st player to do it in league play. It was also Nielsen's 50th start in all competitions and league, he's the 40th to hit that mark in all competitions. He's the 36th player to hit that mark in league play. Chance Myers made his 50th appearance in league play, he tied Nielsen as the 41st player to hit that mark. Kei Kamara also started his 50th game in all competitions for KC, he tied Nielsen as the 40th player to hit that mark. So I thought I'd be able to avoid discussing this issue in depth, but things that have been around today have just made me want to write about it. For those that have been living in a cave the last 24ish hours, last night after Sporting KC's first goal by Graham Zusi, two "fans" in the south stand threw the heads from the Omar Bravo bobble head towards the field. One of the heads hit goalkeeper, Jimmy Nielsen right below his eye. The injury stopped play for about 4 minutes as Nielsen received emergency stitches in his cheek. The team used the high tech cameras to help find the throwers and had the two of them arrested while the other two in their party were removed from the stadium. One of those two, the one that didn't hit Nielsen has been released, Robert Hauver a 21 year old was ticketed with disorderly conduct and was released today. Hauver played football at Lansing High School and walked on at Kansas State, but is no longer on the team. The one who hit Nielsen is still being held (and his name has not been released), and according to the team will be charged with felony aggravated battery. Certainly a very serious situation for both of the young men involved. But one of them earned themselves no fans with his reaction to fans as he was being escorted out. On the team's Facebook page today, a friend of the two apparently posted saying that the two "didn't mean" to hit Nielsen and are in fact season ticket holders. This is what bothers me the most about the situation. Even when drunk, what makes someone think throwing a hard object towards anyone is a good idea? And they didn't mean it? You throw an object in a stadium full of people, even if it's towards the field and you run the risk of hitting someone, stupidity at it's finest. The two have now lost their season tickets and are banned for life from LIVESTRONG Sporting Park, certainly a stiff punishment for the offenders. But I do kind of like Thad's idea of banning them from all sports stadiums/arenas as well. At least for a short term, banning people from multiple stadiums for a situation like this would send a message. These two seem likely that they'll have a bit of an example made of them. This situation though does point to how well the system at the stadium works, as with all the stadium cameras, the throwers were arrested before half time of the game. Another former SKC Wizards update a day late due to the game last night. Some big news involving former Wizards this week. First, the big announcement that one of the greatest Wizards of all time, Jimmy Conrad is hanging them up and taking a job with the Chivas USA staff. A smart move for Conrad who hasn't played since early this season due to a concussion. Now NBC just needs to hire him to be in the booth next year. Also, I can't help but smile reading his goodbye. In other former player news, Eddie Johnson was coming to MLS, and now he's not. He's looking for more money, that MLS was not willing to pay. Can't say I fault either side, Johnson only has a few really high level years left probably and is looking for a final payday. On the other side, he hasn't exactly been lighting it up in Europe and giving him DP money wouldn't be worth it. Finally, MLS pool keeper, Chris Konopka got his first MLS start for New York over the weekend when they played Chicago. Here's the rest of this week's update. Stephane Auvray - New York - Came off the bench and played 30 minutes in New York's 2-2 draw with Chicago. Jimmy Conrad - Chivas USA - Announced his retirement from soccer this week. Taking a job with the Chivas front office. Adam Cristman - LA - Started and played 90 minutes, scoring a goal in LA's 2-0 win over CD Motagua. Luis Gil - Salt Lake - Started and played 90 minutes in RSL's 1-0 loss to Toronto. Taylor Graham - Seattle - Did not dress in Seattle's 0-0 draw with Chivas. Did not dress in Seattle's 4-1 win over Comunicaciones in the CCL. Kevin Hartman - Dallas - Started and played 90 minutes in Dallas' 2-2 draw with Philadelphia. Started and played 90 minutes, recording the shutout in Dallas' 1-0 win over Pumas. Frankie Hejduk - LA - Dressed but did not play in LA's 2-0 win over CD Motagua. Will Hesmer - Columbus - Started and played 90 minutes in Columbus' 3-1 win over New England. Jack Jewsbury - Portland - Started and played 90 minutes, scoring a goal in Portland's 2-1 loss to Houston. Started and played 90 minutes, recording an assist in Portland's 3-1 loss to KC. Mike Jones - New York - Did not dress in New York's 2-2 draw with Chicago. Chris Konopka - New York - STarted and played 90 minutes for New York in their 2-2 draw with Chicago. Jonathan Leathers - Vancouver - Started and played 90 minutes in Vancouver's 4-0 loss to DC. Rauwshan McKenzie - Salt Lake - Dressed but did not play in RSL's 1-0 loss to Toronto. Kurt Morsink - DC - Did not dress in DC's 4-0 win over Vancouver. Scott Sealy - San Jose - Did not dress in San Jose's 2-1 loss to Colorado. Khari Stephenson - San Jose - Started and played 90 minutes in San Jose's 2-1 loss to Colorado. Tyson Wahl - Seattle - Started and played 90 minutes in Seattle's 0-0 draw with Chivas. Did not dress in Seattle's 4-1 win over Comunicaciones in the CCL. Josh Wolff - DC - Dressed but did not play in DC's 4-0 win over Vancouver. Kevin Friedland - Minnesota - Came off the bench and played 12 minutes in Minnesota's 2-0 loss to Tampa. Did not play in Minnesota's 1-1 draw with Carolina. Aaron Hohlbein - Fort Lauderdale - Did not play in Fort Lauderdale's 1-1 draw with Edmonton. Amir Lowery - Montreal - Started and played 90 minutes in Montreal's 4-0 win over Atlanta. Scott Lorenz - Minnesota - Started and played 90 minutes in Minnesota's 2-0 loss to Tampa. Started and played 90 minutes in Minnesota's 1-1 draw with Carolina. Ryan Pore - Montreal - Started and played 90 minutes, recording an assist in Montreal's 4-0 win over Atlanta. Abe Thompson - Fort Lauderdale - Started and played 90 minutes in Fort Lauderdale's 1-1 draw with Edmonton. Edson Elcock - Richmond - Did not dress in Richmond's 0-0 draw with LA. Came off the bench and played 14 minutes in Richmond's 0-0 draw with LA. Tom Gray - Pittsburgh - Started and played 90 minutes in Pittsburgh's 1-0 loss to Rochester. Neal Kitson - Rochester - Started and played 90 minutes, recording the shutout in Rochester's 1-0 win over Pittsburgh. Akeem Priestley - LA - Came off the bench and played 33 minutes in LA's 0-0 draw with Richmond. Did not dress in LA's 0-0 draw with Richmond. Yomby William - Richmond - Started and played 90 minutes in Richmond's 0-0 draw with LA. Started and played 45 minutes in Richmond's 0-0 draw with LA. John Wilson - Charleston - Did not play in Charleston's 4-3 win over Charlotte. Vicente Arze - Diosgyor - Hungary - Dressed but did not play in Diosgyor's 2-0 win over Papa. Herculez Gomez - Tecos - Mexico - Started and played 75 minutes in Tecos' 2-0 win over Atlas. Yura Movsisyan - FC Krasnodar - Russia - Started and played 90 minutes in Krasnodar's 2-1 loss to Krylya Sovetov. Matt Taylor - SC Paderborn 07 - Germany - Came off the bench and played 23 minutes in Paderborn's 1-0 loss to Greuther Furth. Diego Walsh - TOT SC - Thailand - Lost 2-1 to Pattaya United. With Brisket Bob outside the Members Club last night cutting up brisket each time the Wizards scored last night, the team did not disappoint, scoring 3 times as they defeated the Portland Timbers 3-1 at LIVESTRONG Sporting Park. Sporting KC's own Z-Man, Graham Zusi, led the way scoring a brace, and Soony Saad scored a birthday goal on his professional debut. KC dominated the game early on as they have done the past two games against Salt Lake and Seattle, Chance Myers fired an early shot wide of the post, although Troy Perkins appeared to have the shot covered. KC continued to push and Milos Stojcev had a deflected effort go off the bar leaving Perkins stranded as the deflection took the shot the opposite direction. Finally in the 24th minute, KC got their deserved lead. A poorly cleared header by Rodney Wallace went straight to Zusi about 25 yards out from goal. Zusi took a touch and then let fly, leaving Perkins with no chance as the ball flew past him and into the back of the net giving KC the lead. After the goal some idiots decided that it'd be funny to throw the head of one of the Omar Bravo bobbleheads given away for the game. One of them hit Jimmy Nielsen in the eye causing him to require stitches and force the game to be stopped for a few minutes while he received treatment. Thankfully on both accounts, Nielsen was able to finish the game in goal, and the offending parties were arrested, spent a night in WyCo jail and are banned for life from LIVESTRONG Sporting Park. Calling them assholes is an insult to assholes, seriously who throws a heavy object like the head of a bobble head at your own player? KC should have doubled their lead a few minutes later through Teal Bunbury as he got played in behind the Portland defense by Seth Sinovic. Bunbury raced into the box, but took one touch too many, allowing Eric Horst to recover and tackle the ball away before he could get a shot off. In the 40th minute though KC did double their lead, and for the third straight game, it came off of a throw in from Matt Besler. Besler's throw in was flicked on by CJ Sapong to the back post where Bunbury did well to one time it. Perkins had done well to get across the goal and make the initial save, but the rebound fell to Zusi who bundled the ball over the line from a foot out to send KC into the half up. In the second half, KC continued to attack but not as much as in the first. Early on we had some adventures in goalkeeping, as Nielsen misjudged a long clearance that bounced over his head, but Nielsen got back in time to save the ball on the line. Shortly after that, KC almost grabbed a third as a cross from Chance Myers was headed onto the bar by Kei Kamara. Sapong followed up but missed on his acrobatic effort and finally Portland were able to clear. Jack Jewsbury on his return had a good effort blocked by Julio Cesar before it could get through to Jimmy Nielsen. In the 72nd minute, Saad got probably the best birthday present he could think of, and one of the luckiest goals ever. Sinovic played a ball through for Saad, but it was too far in front of him and Eric Brunner attempted to clear it. The clearance though deflected off of Saad, over Perkins and into the net to give KC the 3-0 lead and Saad his first professional goal. In the 80th minute, Portland got themselves on the board, as Wallace found Bright Dike in the box, Dike's little flick went through the legs of Besler and into the net past a diving Nielsen to make it 3-1. Bunbury had a great chance to restore the 3 goal lead. when he was played in down the line by substitute, Michael Harrington. Bunbury attacked Perkins goal, but instead of either taking a quicker shot, or squaring the ball, Bunbury's final touch was heavy and Perkins was able to beat Bunbury to the ball. KC survived a late flurry from the Timbers and captured another win. WIZARDS Man of the Match - Graham Zusi - A brace for the guy the day before his birthday to go along with Saad's birthday goal. Zusi also did great work helping Roger Espinoza to shut down Jewsbury in the middle of the field for Portland. It's been a week and a half since Kansas City last had a league game, but it's back to work tomorrow when the Wizards host the second expansion team this year, the Portland Timbers. The Timbers meanwhile are coming in on short rest, having played in Houston on Sunday. The Timbers went directly from Houston to KC, but will have to replace Lovell Palmer who is suspended due to yellow card accumulation. The Timbers didn't travel with a reserve right back, meaning either finding a guy that can sub in for the game, or flying out someone like Eric Purdy for this game. The game will also mark the return to Kansas City for Jack Jewsbury. Jewsbury, who is captaining the Timbers is having a career year in Portland with 7 goals and 6 assists for the former Wizard. For KC, they've not done well in recent history went coming off a week off. Just this season, KC has come off a weekend off for week performances against Columbus (1-0, possibly the worst performance of the season) and LA (4-1). Hopefully this game changes that recent trend for KC. The team will have Roger Espinoza back from his one game suspension, but will be without Omar Bravo due to his suspension, along with the mounting injury issues. Shavar Thomas is likely to at least return to the bench as cover for Matt Besler and Julio Cesar. The question is whether Teal Bunbury comes on for the suspended Bravo or does Peter Vermes try Milos Stojcev or possibly move Graham Zusi up there. Number to Remember - 6 - The number of points that Portland has earned on the road this season, 1 win and 3 draws for the Timbers away from Jeld-Wen Field. This should be a game that KC gets all 3 points from if they want to be in the playoffs. They still have games in hand on 3 of the 4 teams in front of them, and only 1 point behind New York and Houston. Key Match Up - Roger Espinoza vs Jack Jewsbury - Espinoza needs to keep his attitude in check enough to keep himself from getting a needless red card, but needs to keep the fire that has basically made him the team's best player in the two and a half games he played before his red card against RSL. This is going to be especially true closer to goal where Jewsbury has done plenty of damage this year on free kicks. PREDICTION - Portland isn't a very good road team, and will be playing their second one in 4 days, with a day of travel on Monday. This should be a game that KC should win. Overall KC is the better team all around as well. But KC's recent history coming off of weeks off hasn't exactly been good (it's not just this season), so you have to wonder if Vermes over thinks these long breaks. Hopefully not and the team comes out hungry to play the same way they did against RSL and Seattle. If they do I think KC could win this one going away, but the longer this goes scoreless I think the more confident that Portland will get that they can steal one. Today MLS announced a change to the designated player rule for the next season. The new rule is designed to try to get MLS teams to go after younger designated players. To do this, the league has made the cap hit for younger designated players lower. Players that are 20 or younger will now only take a cap hit of $150,000. Players between 21 and 23 will count only $200,000 against the cap for their team. All other DPs will continue to have the $335,000 cap hit. Certainly gives the incentive for teams to go after younger DPs, that may not bring in the fans due to name recognition, but could raise the talent level for the league. Will be interesting to see if KC goes the route of finding a young designated player next year, in place of or to supplement the two current DPs, Omar Bravo and Jeferson. "We have been under this so many times this season — red cards or non-calls on penalty kicks — at some point, it has to change. As much as players are responsible and coaches are responsible when things don't go well — they either don’t play or get released — the referees seem to keep coming back. "But bad performances should not constitute the opportunity to come back on the field and referee a professional game. If you're not good, you're not, and you shouldn't be out there. You need to go back down somewhere else, just like we do with players sometimes when we send them off to a lower division." But it looks like Vermes' comments may have been just vague enough to avoid a fine/suspension for scrutinizing Jair Marrufo. Sporting KC goalkeeper coach, John Pascarella, was not so lucky though. For his actions and comments after KC's 2-1 loss to Seattle a week and a half ago, Pascarella was handed a 3 game suspension. Pascarella will not be on the sidelines for the next 3 home games against Portland, DC, and Dallas. Having seen Pascarella in practice, he's certainly not a guy that is going to hold back his opinions. For those that aren't subscribed to the feed or on iTunes, you missed the fact that Friday a new From the Byline to the Back Post. Thad and I discussed the new TV deal for MLS, the games that have occurred since out last podcast, the Portland game, our injury crisis, and more. Check it out on Posterous and iTunes. Most Kansas City fans probably didn't expect Guadeloupe midfielder Stephane Auvray to play another game for the Wizards ever after he had basically disappeared from training almost 2 months ago. 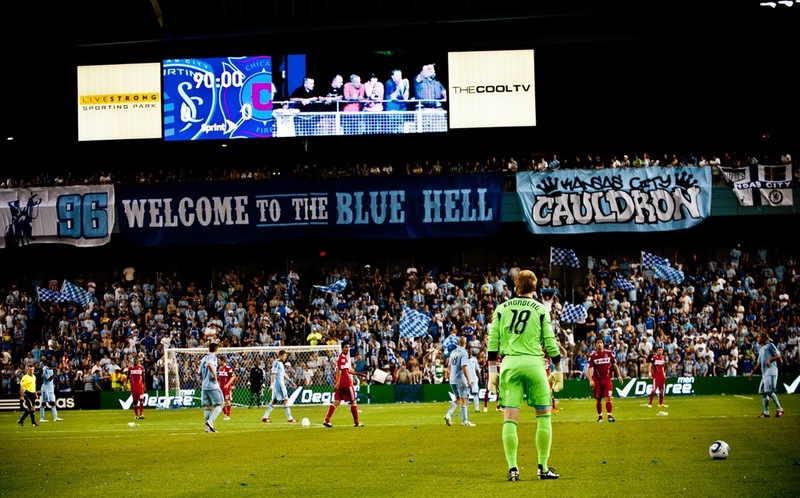 Today that became official as Sporting KC traded the midfielder to the New York Red Bulls. In return, Kansas City get the Red Bulls second round pick in 2013. For a player that was likely gone for nothing at the end of the season, this is actually a good trade for KC. While people may feel we could have gotten more, I'm not so sure. Auvray hadn't done much this year to warrant more of a price tag at this time. Sure he was solid last year, but this year his play hadn't been as good, and he'd found his spot on the team not where he probably thought it should be. With the emergence of Roger Espinoza and even Julio Cesar in midfield, along with Craig Rocastle and even Davy Arnaud that can play more of the withdrawn midfield roll. People saw that he didn't have much of a roll in the team, which likely reduced his value. Add in the fact that Auvray was also making $170,000 against the cap. That's another thing that's going to knock his value down. In the end, with Auvray's role in KC gone, KC went and was able to get something for nothing in this deal, so overall I'm happy with this move. Auvray finishes his career with KC with 27 appearances, 24 starts, and getting just over 2000 minutes in league play. Good luck to him, except when it comes to KC's success. Sporting KC announced that the start time for next Sunday's (8/21) game vs DC United at LIVESTRONG Sporting Park has been changed. The game has been moved from starting at 6pm to 7:30pm. The game was originally supposed to be on Galavision, but with the game being moved it will no longer be on the Spanish channel. No reason was stated by Sporting KC for the change in the time in the press release. The game will still be on KSMO though next Sunday. Shavar Thomas and Roger Espinoza both started for their respective national teams today in friendlies. Thomas and Jamaica were in China to take on the Chinese. Thomas started and played the full 90 minutes after apparently missing his original flight from Kansas City and only arriving in the country over night. The Chinese scored on a corner in the first half and held on for the win, 1-0. Espinoza also started for Honduras tonight in Miami against Venezuela. The midfielder went 82 minutes for Honduras as they defeated Venezuela 2-0 thanks to two goals by Carlo Costly. This week's former SKC Wizards update is here. Nick Cardenas is back on the radar, having played for Sporting KC in their reserve game on Monday, and is apparently still in training now. May have a shot at at least a short term contract with Daneil Cyrus now out. Here's the rest of this week's update. Jimmy Conrad - Chivas USA - Did not dress in Chivas' 3-2 win over new England. Adam Cristman - LA - Started and played 78 minutes in LA's 3-1 win over Dallas. Luis Gil - Salt Lake - Started and played 67 minutes, scoring a in Real Salt Lake's 3-0 win over New York. Taylor Graham - Seattle - Did not dress in Seattle's 2-1 win over KC. Kevin Hartman - Dallas - Started and played 90 minutes in Dallas' 3-1 loss to LA. Frankie Hejduk - LA - Did not dress in LA's 3-1 win over Dallas. Will Hesmer - Columbus - Started and played 90 minutes in Columbus' 2-0 loss to Colorado. Jack Jewsbury - Portland - Did not dress in Portland's 1-1 draw with San Jose. Mike Jones - New York - Did not dress in New York's 3-0 loss to RSL. Jonathan Leathers - Vancouver - Started and played 90 minutes in Vancouver's 4-2 win over Chicago. Rauwshan McKenzie - Salt Lake - Dressed but did not play in RSL's 3-0 win over New York. Kurt Morsink - DC - Did not dress in DC's 3-3 draw with Toronto. Scott Sealy - San Jose - Started and played 57 minutes in San Jose's 1-1 draw with Portland. Khari Stephenson - San Jose - Came off the bench and played 26 minutes in San Jose's 1-1 draw with Portland. Tyson Wahl - Seattle - Started and played 90 minutes in Seattle's 2-1 win over KC. Josh Wolff - DC - Started and played 60 minutes in DC's 3-3 draw with Toronto. Kevin Friedland - Minnesota - Did not play in Minnesota's 3-1 win over Montreal. Did not play in Minnesota's 1-0 loss to Fort Lauderdale. Aaron Hohlbein - Fort Lauderdale - Did not play in Fort Lauderdale's 2-1 win over Carolina. Did not play in Fort Lauderdale's 1-0 win over Minnesota. Amir Lowery - Montreal - Did not play in Montreal's 3-1 loss to Minnesota. Started and played 45 minutes in Montreal's 3-3 draw with Tampa. Scott Lorenz - Minnesota - Started and played 83 minutes in Minnesota's 3-1 win over Montreal. Started and played 90 minutes in Minnesota's 1-0 loss to Fort Lauderdale. Ryan Pore - Montreal - Started and played 61 minutes in Montreal's 3-1 loss to Minnesota. Started and played 68 minutes in Montreal's 3-3 draw with Tampa. Abe Thompson - Fort Lauderdale - Started and played 66 minutes before being red carded in Fort Lauderdale's 2-1 win over Carolina. Did not play in Fort Lauderdale's 1-0 win over Minnesota. Stephen Armstrong - Charleston - Came off the bench and played 24 minutes in Charleston's 2-1 loss to Orlando. Edson Elcock - Richmond - Started and played 66 minutes in Richmond's 3-0 win over Dayton. Started and played 77 minutes in Richmond's 2-0 win over Wilmington. Tom Gray - Pittsburgh - Started and played 90 minutes, scoring a goal in Pittsburgh's 2-2 draw with Charlotte. Neal Kitson - Rochester - Started and played 90 minutes in Rochester's 3-0 loss to Charlotte. Started and played 90 minutes in Rochester's 2-1 loss to New York. Akeem Priestley - LA - Started and played 45 minutes in LA's 2-1 loss to Wilmington. Did not dress in LA's 3-0 loss to Antigua. Yomby William - Richmond - Started and played 90 minutes, scoring a goal in Richmond's 3-0 win over Dayton. Started and played 90 minutes in Richmond's 2-0 win over Wilmington. John Wilson - Charleston - Started and played 90 minutes, picking up a red card in Charleston's 2-1 loss to Orlando. Vicente Arze - Diosgyor - Hungary - Came off the bench and played 32 minutes in Diosgyor's 2-0 loss to Fehervar. Pablo Escobar - Deportivo Cali - Colombia - Off until 8/15. Herculez Gomez - Tecos - Mexico - Started and played 90 minutes in Tecos' 1-0 loss to Tigres. Carlos Marinelli - Universidad San Martin - Peru - Started and played 30 minutes in San Martin's 2-0 win over Universidad Cesar Vallejo. Yura Movsisyan - FC Krasnodar - Russia - Started and played 70 minutes in Krasnodar's 2-0 win over Amkar Perm. Matt Taylor - SC Paderborn 07 - Germany - Started and played 69 minutes in Paderborn's 3-0 loss to Union Berlin. Diego Walsh - TOT SC - Thailand - Lost 1-0 to Chonburi. 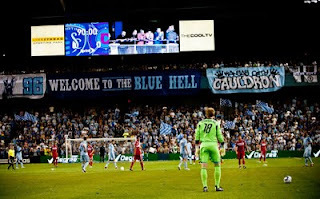 Today Sporting Kansas City announced the beginning of their season ticket renewal process for the 2012 season. The team has put out the pricing as well as the renewal process. Overall, pricing as a whole isn't increasing by much at all as a whole, in fact for some it is going down. The Member's Club price is going down from $280 to $260, the East Stand midfield and it's sun issues is going down $40 from $700 to $660. The West Stand has the biggest drop with a $100 drop from $800 to $700. The East Stand pricing is staying at $500 as is the West Stand goal line at $600. The South Stand is seeing a $20 increase from $360 to $380 and the Stadium Club price is increasing $150 from $1,250 to $1,400. The team has also added two new price areas, the East Stand Goal Line for $400 and the Budweiser corner for $1,200. The ticket pricing again for this season is based on a 20 game season. So it would seem likely that we'll once again see a 17 game league season with 3 special games as we had this year. It's not surprising that it appears that MLS is moving away from the balanced schedule next year. Renewing early also has it's incentives. Rewnew in full before Tuesday, September 6th, and you get your choice of a game in the Budweiser Stand or a pass for you and a guest to the Victory Suite, along with your choice of Access Packs. The two access packs are set up for people that renew using the payment plans. Pack A is shield club access for a game and scoreboard recognition, while Pack B is VIP access on the field for warm ups, and your photo on the field. All of these incentives are for the 2012 season. While the overall price as gone down some, the price as a whole is going up for most. When you try to renew, along with the basic price of your season tickets (as listed above), there is $40 in service charge and Village West Tax. The service fee is understandable, last year the service fee was $10 to $20 depending on what renewal process you used. So that takes care of probably $20 of the $40, but what about the Village West Tax. It appears that the Unified Government and Village West now tax events at the Legends area with a $1 per ticket charge. So for example, I'll be paying $300 for my tickets in the Member's Stand next year. But that's basically what I paid last year after you factor in the $20 service charge I paid with my installment plan that I did. Still it's interesting that there's been a new tax added to events at Village West. That's something that could certainly cause some issues in the future. It'll be interesting to see if KC can keep or even expand their current base of over 11,000 season ticket holders. The injuries for Sporting Kansas City seem to continue to mount up, with news on two more players coming out today. First for some good news, the team posted on Twitter today that captain, Davy Arnaud had returned to training. Combine that with the return of Craig Rocastle to game play yesterday in the reserve game. The two of them will help boost the midfield that has suffered some injuries and suspensions lately. Still, though there are plenty of injury issues going around. Aurelien Collin is still out with his back injury. Best case scenario could see him back probably in early to mid-September. But if recovery goes slowly, Collin could miss longer. Back injuries are something that can take a long time to heal depending on the person. Hopefully he's on the short side. Especially since today word came out that KC is down another central defender. Newly signed, Daneil Cyrus has broken the 5th metatarsal in his left foot. The injury will require surgery and will see him miss the rest of the 2011 season. Combine those two and it's a blow to KC. Now KC only has 3 central defenders on it's roster, Matt Besler, Julio Cesar, and Shavar Thomas. Thomas had likely been on the trade block and transfer list up until the injury to Cyrus. Now KC can't afford to get rid of the Jamaican, as he's the only back up KC has if Besler or Cesar gets injured. I'd said that previously I wanted KC to get another center back. There's 6 days left in the MLS transfer window to go shopping outside the league, but the trade deadline is still about a month away so KC could get someone within the league. But everyone knows Cyrus is now up and the price for KC to get a defender just went up. The other possibility is that KC signs a free agent, for example, a guy like Nick Cardenas who the Wizards drafted in 2010 and played 90 minutes for KC in the reserve game yesterday. It'll be interesting to see if KC makes a move. The other new injury is the rumor that Andrew Wiebe posted today about Luke Sassano. Sassano limped through the last 2 minutes plus stoppage time of the game on the weekend against the Sounders after a collision with Lamar Neagle. Wiebe has heard that Sassano has a sprained MCL and will miss the next 4-6 weeks recovering from the injury. The injury looked a lot worse watching it on replay after the game. With Arnaud and Rocastle on their way back, this injury may not hurt as much, but until they're able to go KC is going to have some depth issues at midfield. Especially when you factor in that we haven't heard anything with regards to the status to Jeferson, who limped off to be replaced by Sassano against the Sounders. Hopefully with the extra time off, Jeferson will be ready to go in about a week against Portland. But if he can't the injury crisis could continue.